When I was a little girl, the one thing I looked forward to more than anything else in the months prior to Christmas was the Sears catalog. About the size of a phone book and fully loaded with colorful advertisements, it was the shopping Bible for my tiny girlish heart, giving me a ideal format for helping Santa Claus pick out all of the perfect gifts to put under the tree. The best part was taking up a crayon to make a list of the most desired toys, knowing full well that not all of them would be there on Christmas morning. But maybe, just maybe, the top two or three would be there, along with a few unlisted, unanticipated presents for added glee. Now, as an adult, when Christmas functions much differently and without too many surprises, it’s nice to have something like E3 to keep those anticipatory feelings alive. I’m still making lists and I’m still hoping that at least two or three of the titles on it will blossom into a fantastic experience, and that most of them will be playable at PAX Prime, my personal E3. Assassin’s Creed Revelations: This one is a given, but I am hoping that Ubisoft will talk more about the future of the franchise than about ACR itself. 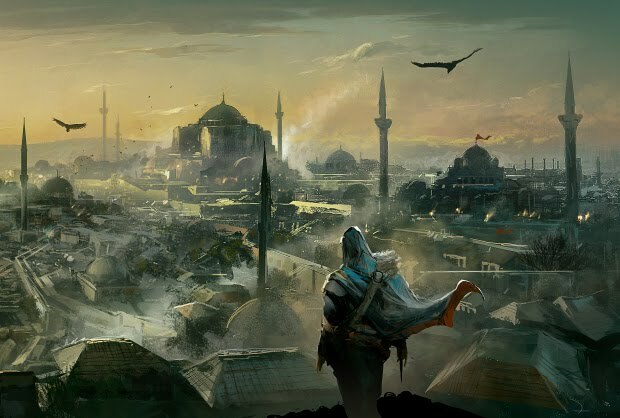 I assume the focus of ACR is going to be primarily on Ezio, with only mere glances back into the life of Altair, but my ideal scenario would be a perfect split between both. I feel as though Altair never really got his due screen time, considering what a repetitive mess the series started as. Don’t get me wrong, I adored it for its originality and beautiful scenery, but the controls were extra wonky and the idea of gathering 300 different flags scattered throughout the countryside was OCD madness. I am excited to see what direction they take the story in the chapters beyond the Renaissance. **Update** Beautiful Trailer. I'm totally basking in its goodness. From Dust: Any game that is described as a ‘spiritual successor’ to Populus, a favorite from my childhood, is a winner in my book. 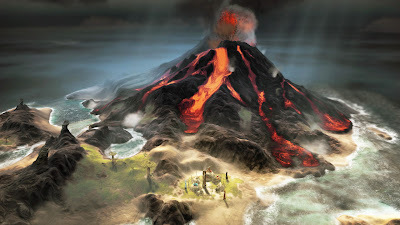 The initial trailer for the game, released last year, showed a bird’s eye view of sweeping landscapes full of roiling oceans and erupting volcanoes. Absolutely gorgeous! Originally Ubisoft claimed we would see this game in the first half of 2011 on XBLA & PSN, but I bet it will be more like mid-summer. Either way, I can’t wait to see more. Arkham City: After seeing the newest trailer for the game featuring Catwoman sashaying all over town, October can’t come fast enough. I adored Arkham Asylum, so I hope they don’t switch up the gameplay too much. The bat vision could probably go, or they could give you less incentive for keeping it on all of the time, but I am happy to see the Joker is still around. He’s such a delightful villain. I am less excited about the Penguin, but that is because Danny Devito ruined that character for me during Batman Returns – too much sniveling in thermal pajamas for my liking. Bioshock Infinite: I am sticking to my guns about not delving too much into the pre-release material regarding Columbia in all of her finery. With the game still slated for 2012, my vow to be mostly surprised by its content is in full effect, and I am grateful for it. I don’t think I will be able to hide from it once PAX comes around if Irrational has any demos available by then, but I’ve done well so far. That being said, one of my favorite moments of PAX East was during the Irrational Panel, where they described the motivations for creating the game more than the game itself, which I appreciated. All I want from the press conference is the slated release date for the game. Then I can plan accordingly. Alan Wake-Night Springs: Finally, the time spent sitting in front of a television watching a show on a television is paying off! I've only known about this game for a couple of weeks now, so I am eager to find out more. Surprisingly, these are really the only titles I have any real interest in, but then again this list is mostly off the top of my head and not via extensive brainstorming and research. There have been some rumors of a new Fable game surfacing on the horizon, but with Kinect capabilities, which I am generally uninterested in considering that my teensy tiny living room has never and will never be able to support the motion sensor. Microsoft, if you are going to make the big titles Kinectible, please keep them ‘enabled’ and not ‘exclusive’, okay? It’s not that I am actively trying to boycott the little Wall-E looking device, I just can’t buy a new house in order to use it. Child of Eden is probably the only game I really want to play using the Kinect, but I imagine it will be just as fun with a controller.